The Meso-Cenozoic evolution of eastern China topography is characterised by the formation of several basins and mountains. However, there are some anomalous changes of the topography cannot be well explained by lithospheric deformation, especially in areas with no deformation. Here we investigate the how mantle-driven long-wavelength topography has shaped the surface topography of North China. In North China, the western part has been tectonic stable with no structural deformation in the Meso-Cenozoic. Nevertheless, the tectonic subsidence curve of the Ordos Basin (located in western North China) reveals an episode of fast subsidence in the Early Cretaceous, followed by slow subsidence in the Late Cretaceous, indicating the influence of processes other than lithospheric deformation. The vertical motion of dynamic topography matches the subsidence history well, indicating the influence of mantle conversion is a viable explanation for the subsidence of the Ordos Basin. The southward transport of sediments in North China in the Late Jurassic is also consistent with the modelled southward dynamic tilting of the area. In the east, the Early Cretaceous subsidence and Late Cretaceous uplift of the North Yellow Sea Basin can also be explained by model dynamic topography decently. In Northeast China, the Late Cretaceous anomalous subsidence history also matches the temporal change of the dynamic topography decently. We carried out an apatite fission track study in the Taihang Mountains (central North China) and northern South China earlier. The study in the Taihang Mountains shows a four-stage evolution: Late Jurassic fast exhumation, Cretaceous slow exhumation, early Cenozoic fast exhumation and late Cenozoic slow exhumation. The dynamic topography model also shows four-stage evolution: dynamic uplift in the late Jurassic Period, dynamic subsidence in Cretaceous Period, renewed dynamic upilft in the Early Cenozoic and dynamic subsidence in late Cenozoic. We propose that mantle flow influenced surface exhumation. The northern South China apatite fission track study reveals fast exhumation during 80-60Ma and slow exhumation afterwards, which is consistent with rapid dynamic uplift between 80-60 Ma followed by slower dynamic uplift between 60-40 Ma. Dynamic subsidence is at odds with continued exhumation since 40 Ma, which could reflect ongoing erosion of the topography created by the early phase of rapid uplift. 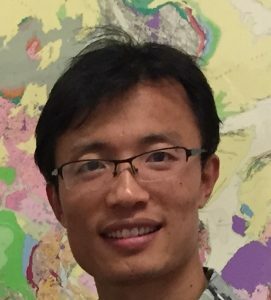 This research project is a very important part of my PhD study, which links all the geological data I collected before with geodynamics and offers me a better understanding of the the Meso-Cenozoic geological processes of eastern China. Xianzhi Cao, Sanzhong Li, Liqing Xu, et al., 2015. Mesozoic–Cenozoic evolution and mechanism of tectonic geomorphology in the central North China Block: constraint from apatite fission track thermochronology. Journal of Asian Earth Sciences 114: 41-53. Xianzhi Cao, Sanzhong Li, Xin Liu, et al., 2013.The intraplate morphotectonic inversion along the Eastern Taihang Mountain Fault Zone, North China and its mechanism.Earth Science Frontiers,20(4): 088-103. (In Chinese). Youchen Xue, Xianzhi Cao, Liqing Xu et al., Application of remote sensing to fault study: A case study of the Zhangjiakou-Penglai fault zone. Chinese Journal of Geology. 50(2): 564-580. (In Chinese). Liqing Xu, Sanzhong Li, Xianzhi Cao et al., 2016. Holocene intracontinental deformation of the northern North China Plain: evidence of tectonic ground fissures. Journal of Asian Earth Sciences 119: 49-64. LV Dmitrienko, Sanzhong Li, Xianzhi Cao et al., 2016. Large‐scale morphotectonics of the ocean‐continent transition zone between the Western Pacific Ocean and the East Asian Continent: a link of deep process to the Earth’s surface system. Geological Journal. 51: 263-85. EarthByte Welcomes visiting student Xianshi Cao.